The seamless steel pipe is formed by perforating a steel ingot or a solid tube blank, and then hot rolled, cold rolled or cold drawn. 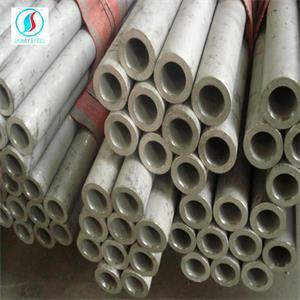 The seamless steel pipe has a hollow section and a long strip of steel without joints around it. A large number of pipes used for conveying fluids. Compared with solid steels such as round steel, steel pipes are lighter in weight when they have the same bending and torsional strength. They are economical section steels and are widely used in the manufacture of structural and mechanical parts. The raw material for rolling the seamless pipe is a round tube blank, and the round tube embryo is cut into a blank having a length of about 1 m by a cutting machine, and sent to a furnace for heating via a conveyor belt. The billet is fed into a furnace and heated to a temperature of approximately 1200 degrees Celsius. The fuel is hydrogen or acetylene. Furnace temperature control is a key issue. After the round billet is released, it is subjected to a through-hole punching machine. The more common perforating machine is a conical roller punching machine. This perforating machine has high production efficiency, good product quality, large diameter of perforation and can wear a variety of steel types. After perforation, the round billet is successively rolled, rolled or extruded by three rolls. After extrusion, the tube should be sizing. The sizing machine is rotated at a high speed by a conical drill bit into a steel core to form a steel pipe. The inner diameter of the steel pipe is determined by the outer diameter of the sizing machine drill bit. After the steel pipe has been sized, it enters the cooling tower and is cooled by water spray. After the steel pipe is cooled, it is straightened. After the steel pipe is straightened, it is sent to a metal flaw detector (or water pressure test) by a conveyor belt for internal flaw detection. If there are cracks inside the steel pipe, bubbles and other problems will be detected. After the quality inspection of the steel pipe, it must be carefully selected by hand. After the quality inspection of the steel pipe, the paint is sprayed with the number, specification, production batch number, etc. It is hoisted into the warehouse by a crane. 2. Cold drawn (rolled) seamless steel pipe: round tube blank → heating → perforation → head → annealing → pickling → oiling (copper plating) → multi-pass cold drawing (cold rolling) → blank tube → heat treatment → straightening →Hydraulic pressure test (inspection) → mark → storage. The rolling method of cold drawn (rolled) seamless steel pipe is more complicated than hot rolling (extrusion seamless steel pipe). The first three steps of their production process are basically the same. The difference begins with the fourth step. After the round billet is hollowed out, it is required to start and anneal. After annealing, it is acid washed with a special acidic liquid. After pickling, apply oil. This is followed by a multi-pass cold drawing (cold rolling) of the blank tube, followed by a special heat treatment. After heat treatment, it is straightened.